Interesting news from Corgi that the company is linking up with the British Land Speed Record (LSR) team, headed by former record-holder Sir Richard Noble. The team's aim is to build the Bloodhound SSC jet-and-rocket-powered car, its target, to smash the current LSR with an amazing 1000 mph (1609 km/h) two-way run - that’s a Mach 1.4 machine, running at ground level! 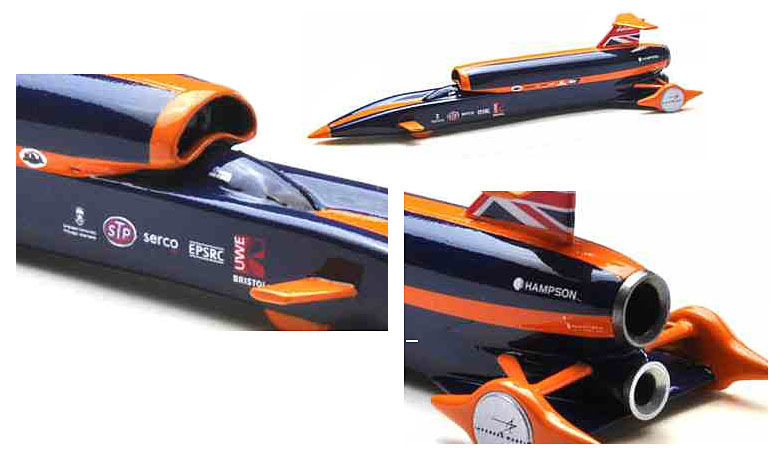 Corgi’s role is to be the official toy and model partner for a series of replica models of the Bloodhound, as the vehicle is developed into its final record-ready form. So there should be a mini-collection opportunity for tech-hungry diecast fans. I saw the Bloodhound display at the Farnborough Air Show last summer, and took the set of iPhone pix shown here. 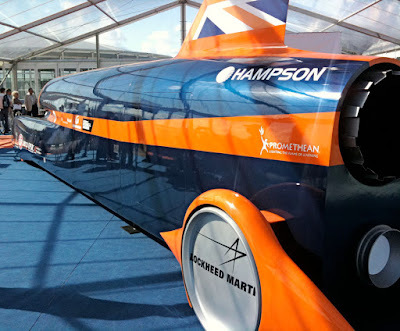 It’s a hugely impressive project, even if the Farnborough Bloodhound SSC was only a life-size development mockup. The Bloodhound's triple-engine technology is a complex combination of EJ200 turbofan engine, a type normally seen powering the EFA Typhoon combat jet, plus a hybrid Falcon rocket motor. Fuel for the EJ200 and Falcon is pumped by a third power plant, an 800 bhp racing engine. Construction on the real car started just a few days ago, the aim being to have it ready for runway trials in Spring 2012. 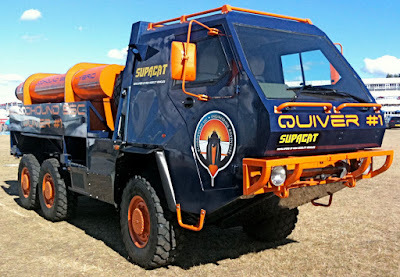 If all goes well with the trials, then the Bloodhound SSC team will move on to high-speed runs in South Africa later the same year. There’s a choice of 14 possible sites for the actual LSR attempt, but that final choice is not yet finalized. 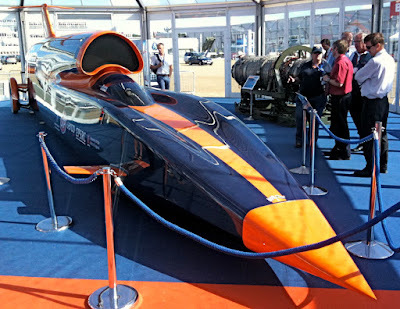 The sneak peeks above show what Corgi has in mind for the Bloodhound SSC. It looks pretty good, but we’ll wait to see if the finished thing is a match for Corgi’s excellent scale aircraft, which is the sort of standard we’d like to see at Scale Model News. Fingers crossed then! Fascinating as the LSR concept and cars are, it’s been a continuing puzzle to me that the mainstream kit manufacturers have stayed away from the subject. And the history is a long one - LSR attempts go all the way back to 1898, when a French-built electric car raced along at 39.2 mph (63.15 km/h). But so far as scale models go, the running has been made by the diecast companies over the years, and here we are again with Corgi doing the same thing. Anyone got an idea why this should be? 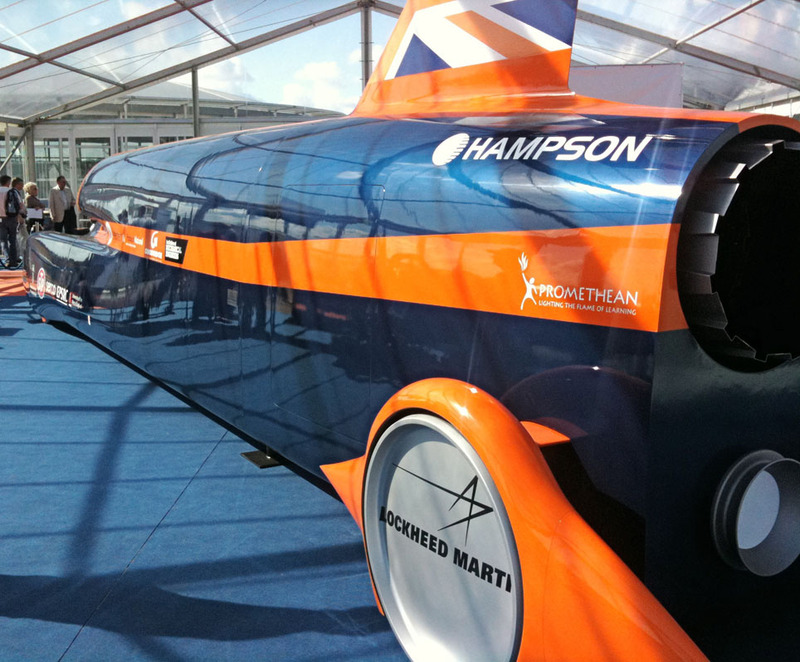 1-2 Bloodhound SSC mockup at Farnborough Air Show, 2010. 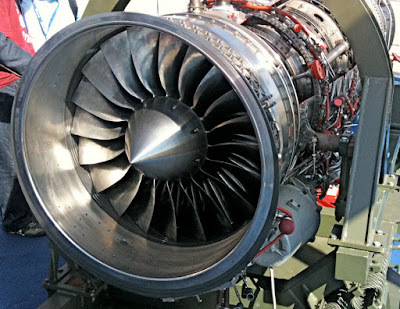 4 Eurojet EJ200 turbofan engine. 5 One of two 10-tonne Supacat HMT600 support vehicles, loaned by the company to the Bloodhound SSC team. Assorted LSR related stuff here. And some interesting diecast cars here, mainly Spark models.